Ring in the Holly Days! The perfect solution for non-profit organizations in Dayton and surrounding areas. 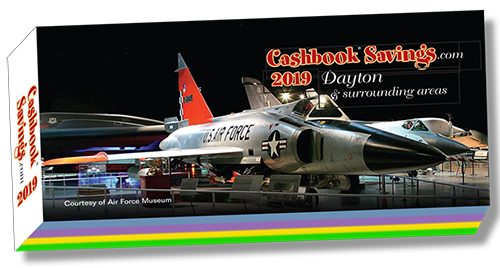 The 2019 DISCOVER DAYTON CASHBOOK IS A GREAT FUNDRAISER! Earn money for your organization with the Discover Cashbook! Full of dining & entertainment coupons for 50% off at well-known area merchants including El Toro, Smashburger, Roosters, Poelking and many more! This book is back by popular demand. It sells well each year and for 2019, we have new merchants including Rapid Fired Pizza, Hot Head Burritos, Jamaica Run Golf, Kings Island, and more! The book sells for $20 and your organization profits $10 per book! One organization earned more than $5,500 with this fundraiser last year! Help your group reach their fundraising goals by selling Discover Cashbook Savings Books! Participants can sell to friends, family, and neighbors. The book is a great value and pays for itself after a couple of uses! Makes a great gift! Contact us at (937) 435-1780 or SchairbaumEnterprises@gmail.com to get started today! For 54 years, Schairbaum Enterprises has helped hundreds of schools and non-profit organizations raise funds through profitable fundraising programs provided by the best suppliers in the industry. 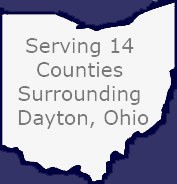 We are part of your community, located in Dayton, and proudly serving Dayton and 14 surrounding counties. We are family owned and operated, putting the utmost care into your programs. Come visit us at our offices and display rooms. Taste test our quality products and see the operation, including our very own in-school student Holiday Gift Shoppe® that provides support for so many groups! We put the "Fun" in Fundraising! Helping Kids Achieve Their Goals Throughout Greater Dayton. Schairbaum Enterprises has provided profitable fundraising projects to hundreds of schools and non-profit organizations in the Dayton area for over 50 years. As one of the few family owned fundraising companies in Southwest Ohio, we have been successful by introducing a combination of outstanding service and product quality from top product suppliers. We are proud to offer our clients a great Gift Catalogue, “Discover Dayton” Cashbook Coupon Savings, the nationwide Entertainment Digital Savings Membership and similar specialized product offerings to help you reach your fundraising goals. Customer organizations include school PTO and PTA parent associations, athletic and sports booster clubs, band and cheerleader members, church missions and other non-profit groups. We are unique in having a local warehouse to provide our clients with the freshest products and rapid response to their fundraising needs in the most economical way possible. Our comprehensive package of services at no additional cost includes custom letters and sales materials for each participant, order processing and packaging at our local facility and delivery to your location. We are also distributors for some of the finest fundraising providers in Ohio* and nationally such as Anthony Thomas* candy bars; Auntie Anne’s and Cinnabon frozen products, Main Street Gourmet cookie dough*, Pine River cheeses and snacks, Pine Valley personalized cookie dough tubs for Future Farmers of America, and VanWyk pretzel rods. 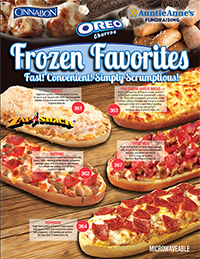 Our own custom Frozen Favorites brochure includes Zap-A-Snack microwaveable pizzas and the new Oreo Churros and Cinnamon Gooey Bites. Fundraising is hard enough without having the concern about product quality and delivery details. We take the worry out so that you can focus on a successful program and customer support and satisfaction. We are proud of our long history supporting worthwhile causes in Southwest Ohio and our unequaled commitment to maintaining the highest product quality and service to our sales partner organizations. We are charter members of the Association of Fundraising Distributors and Suppliers (AFRDS), and share their mission “To Unify, Educate, and Safeguard the fundraising industry”. We are the area distributor for these customized products. There are no minimums; no art charges. All sales supplies, order posting, packing and delivery of larger orders is inclusive. #16SC 16oz Stainless Steel Tumbler - Drink-Thru Lid, Double Wall Construction, BPA Free, Hand Wash Only, Hot or Cold Drinks, No Sweat, Fits all cup holders, Gift boxed. #WBSC 16oz TRITAN Sport Water Bottle - Flip Up Lid, Double Wall Construction, BPA Free, Top Rack Dishwasher safe, No Sweat, Fits all Cup holders, Gift boxed. #24SC 24oz Double Wall Insulated Tumbler - Drink-Thru Lid, BPA Free, Top Rack Dishwasher Safe, Cold or Hot Drinks, No Sweat, Fits all cup holders, Gift boxed. #20SC 20oz Stainless Steel Double Wall vacuum sealed tumbler - 18/8 highest quality of stainless steel (no rust). Vacuum sealed to keep beverage COLD/HOT. They keep drinks cold for over 24 hours and hot for over 6 hours (no sweat). They are BPA approved, fit all cup holders and are gift boxed. Laser Engraved. #30SC 30oz Stainless Steel Double Wall vacuum sealed tumbler - 18/8 highest quality of stainless steel (no rust) Vacuum sealed to keep beverage COLD/HOT. They keep drinks cold for over 24 hours and hot for over 6 hours (no sweat). They are BPA approved, fit all cup holders and are gift boxed. Laser Engraved. #HD30 TUM 30 Handle - Fits 30 oz Tumbler for easy handling and drinking. We are proud to announce our affiliation with Otis Spunkmeyer Fundraising products including their Cookie Dough, Muffins and Brownies. Otis Spunkmeyer, an ® brand is a leader in the sweet baked goods industry. The company began in 1977 in California and more than 35 years later they are the #1 selling foodservice cookie dough in fundraising. Their quality control policies are unequaled. They comply with every regulation and their plants are consistently rated “Superior”. They are deeply commited to Social Responsibility and Sustainability. Otis Spunkmeyer is loved all over America, and especially by kids. Young people already have a connection to the Otis Spunkmeyer brand because we're the cookie brand they know from school. We are proud to initially offer 13 of their famous cookie flavors plus the Double Chocolate Chip Brownies and variety pack of Muffins. Schairbaum Enterprises introduced the Main Street Gourmet Cookie Dough to this area many years ago and we still offer their great products. The company continues to expand and provide a variety of quality cookies for our customers. The Otis Spunkmeyer program is now part of our promise to supply our clients with the best available foods to enhance their fundraising projects. We are extremely pleased to offer the great tasting delicious baked goods they provide as featured above. FROZEN FAVORITES features the top sellers for Auntie Anne’s, Zap-A-Snack microwaveable Pizzas and a variety of delicious, convenient breakfast and dessert items. You take the orders, we process, pack by seller and deliver to you. Check with us for details and click on the other categories listed above for additional information. We are booking our Holiday Shoppes now and urge you to visit, see and touch the gifts we offer that will be treasured by your parents and family members. LOCAL IS GOOD! Come visit us, shop our close-outs, enjoy tasty treats and compare quality, pricing and service. Our client appreciation sale is especially for you all next week before we open to the public. The new MAIN STREET COOKIE DOUGH brochure is now available and features 9 varieties include the SALTED CARAMEL flavor which is awesome! 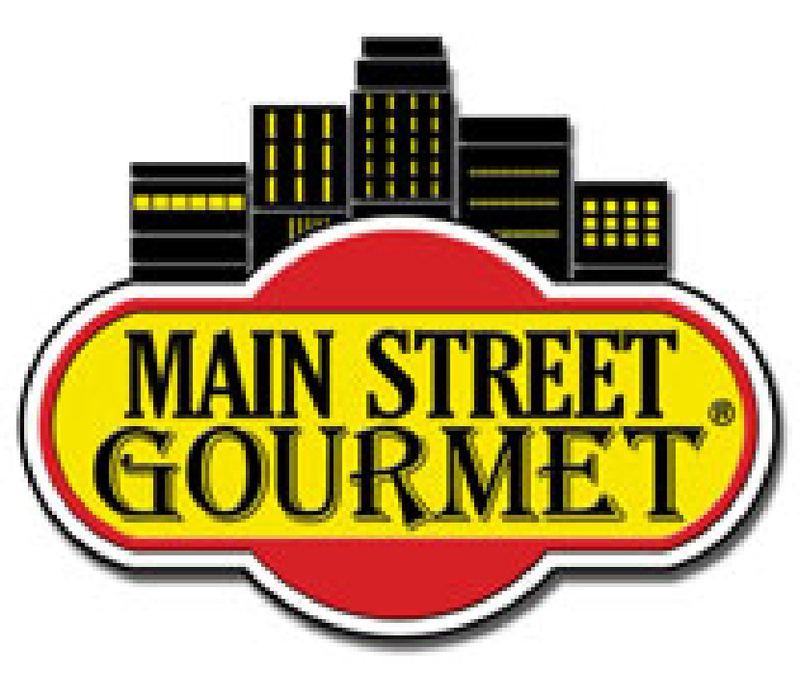 Main Street Gourmet has proudly supported the fundraising efforts of countless organizations with high quality items since the year 2000. Their pre-portioned cookie dough will boost profits and encourage repeat business. Customers will become loyal supporters of these fresh baked treats and will look forward to your cookie dough sales year after year. The cookies are easy to bake and packaged to keep in the freezer. Our 27th Holiday Shoppe is over and it was very successful. Our largest school purchased almost $11,000 from our private selection of quality gifts. The details on our registered program follow. Please read now and compare what you received in products, costs and services with this information. Samples are already arriving for the coming year – initial orders were placed at our national January conference. We continue to expand our affiliations with companies in the gift industry to provide the highest quality reasonably priced items. We do not supply pre-packed kits that can be purchased from large vendor and passed on to you. Ours are all custom packed using information from your sales history that we keep on file. Our program provides your students with the opportunity to select special gifts for their family members and friends in a private, “non-commercial” atmosphere. This program is designed to benefit the children and is a learning experience for them to handle and budget their money. It is a special service for them and is not intended to be a major fund-raising project. Gifts are coded by category and you select your pricing. 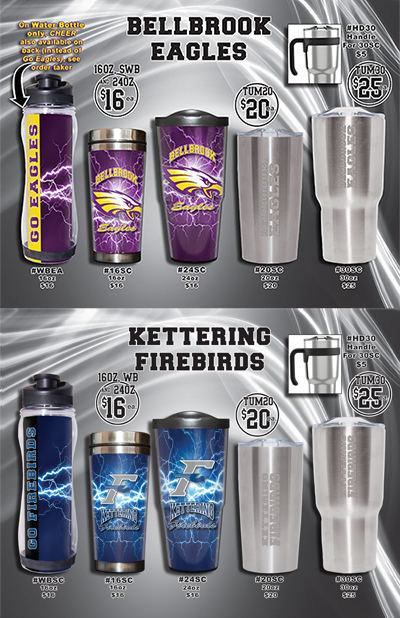 Our family-owned company has provided unique gifts for almost 30 years to schools in our southwest Ohio area. Quality products and reasonable pricing are the key to our success. This risk-free program is usually sponsored by the parent group with assistance from their volunteers. It is intended to be a memorable experience for everyone involved. All gifts are hand selected and custom packed for your group. Our standards are high, our services are unequalled and our goal is satisfaction. All promotional materials are provided including special incentives. We suggest that you visit our LOCAL facility in Kettering and compare the gifts and program we offer to see the difference. This event is too important and everyone involved should be pleased. The trip to our display room is very worthwhile since our shoppe includes such a wide-ranging variety of unique items. We will bring samples to you for evaluation if preferred. NO RISK. You pay for what you sell and there are no hidden fees. Delivery is from our local warehouse. Additional products are supplied for next day needs and we pick up at the end of your event. PLEASE CALL US FOR FURTHER INFORMATION. THANK YOU.